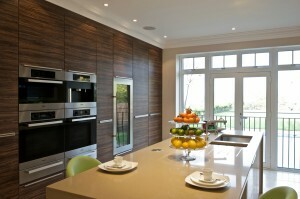 Designer kitchens are a combination of traditional kitchens, contemporary kitchens and in-frame kitchens. They boast a larger than average space and benefit from an open plan flowing space that typically incorporates family living space too. 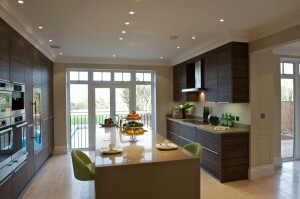 These designer kitchens are fully bespoke and made to order and feature additional internal kitchen storage, kitchen lighting and clever design features and really showcase what is possible when space is not an issue. 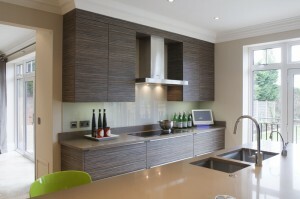 Designer kitchens can easily be adapted to allow some of the features to suit a smaller space though and our recently completed kitchen designs and kitchen installations below showcase a broad mix of what we can achieve when designing your dream kitchen. This large, ultra modern designer kitchen and living space features the Burbidge Malmo Gloss White handleless door, combined with glass splashbacks to the wall and Silestone worksurfaces. Centre point of this designer kitchen is an original 1960's AGA, combined with SMEG Oven and Combination Oven, SMEG Induction Hob and an integrated Fridge Freezer. This large family living space features the Burbidge Salcombe traditional in-frame kitchen style, painted in a very trendy mix of Soft Grey and Charcoal to the island. 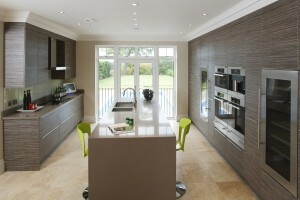 Silestone worksurfaces in the main kitchen with Rustic Oak solid wood surfaces to the island finish this stylish space. At the heart of this designer kitchen is a Rangemaster Range Cooker, with kitchen units built around an American fridge freezer to help integrate it, along with a Caple Wine Cooler and a Siemens Integrated Dishwasher in the island section. 300mm pullout larder storage units also feature, along with integrated wood chopping blocks. This large, bright modern designer kitchen features the Marpatt Airo door, in a mixture of Gloss Graphite and Porcelain and complemented by Caesarstone worksurfaces. An extension to this traditional cottage allowed the creation of a large modern family living space. This designer kitchen is very much the heart of the home and was supplied in Burbidge Petworth in-frame kitchen style, painted soft grey and with Caesarstone worksurfaces and solid oak to the small island with a glazed section which showcases the original water well. 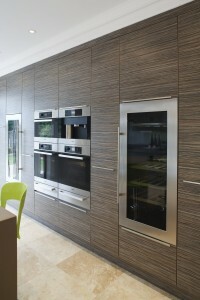 The centre piece of this designer kitchen is the Rangemaster range cooker but also includes and integrated Siemens dishwasher and a Caple wine cooler. Following an extension to the property, this newly created L-shaped traditional designer kitchen was designed and installed for the space, featuring the Burbidge Tetbury in-frame kitchen painted in a mix of soft grey and cement to the accent features and island. 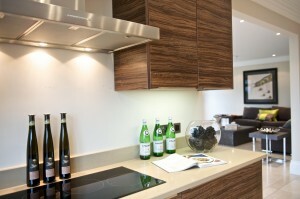 The stylish kitchen was complemented by Cimstone worksurfaces. Again the centre point of this kitchen is the Rangemaster range cooker, whilst also including a Siemens integrated dishwasher, Siemens integrated washing machine and integrated fridge / freezer. 300mm pullout larder storage units also feature, along with integrated internal bins. 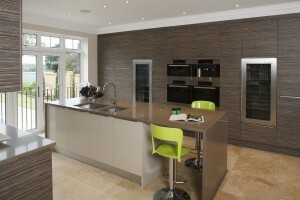 This larger than average modern designer kitchen has been supplied in the exclusive Second Nature Metris Kitchens Textured Wenge with vibrant Granite worksurfaces. This large designer kitchen has been supplied in the Burbidge Tetbury in-frame kitchen style, painted Soft Grey and complemented by complementary Granite worksurfaces. This classic look designer kitchen features modern appliances with a Siemens Induction hob, Siemens Oven, Siemens Combination Oven and Siemens warming drawer, along with a Siemens Microwave and Quooker boiling water tap. This modern, bright large designer kitchen was created for a new build development and features a modern Amazona slab door from Unitech Oxon, with an integrated trim handle to provide clean lines and supplied with Silestone worksurfaces. 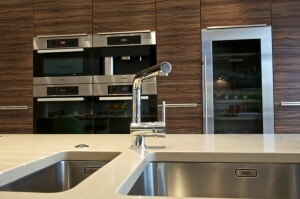 A large bank of appliances features Miele Double Ovens, Miele Warming Drawer, in addition to Miele Integrated Fridge/Freezer, Miele Integrated Dishwasher and Miele Gas Hob in the island section. Combining the existing dining room and kitchen has created this large, light space which has been installed with a Burbidge Lansdowne Natural Oak kitchen and complemented by Granite worksurfaces. Featuring a host of modern appliances, this designer kitchen features a Siemens Induction Hob paired with a Siemens Oven and Siemens Combination Oven and Siemens Warming Drawer. With kitchen units built around an American fridge freezer to help integrate it, there is also a Siemens Integrated Dishwasher with a Caple Sensio Wine Cooler at the end of the kitchen island. This modern, bright large designer kitchen was created for a new build development and features a modern Dark Cordoba slab door from Unitech Oxon, with an integrated trim handle to provide clean lines and supplied with Silestone worksurfaces.